Smart cities appeared in literature in the late 1990s and various approaches have been developed so far. Until today, smart city does not describe a city with particular attributes but it is used to describe different cases in urban spaces: web portals that virtualize cities or city guides, knowledge bases that address local needs, agglomerations with information and communication technology (ICT) infrastructure that attract business relocation, metropolitan-wide ICT infrastructures that deliver e-services to the citizens, ubiquitous environments, and recently ICT infrastructure for ecological use. Researchers, practicians, businessmen, and policy makers consider smart city from different perspectives and most of them agree on a model that measures urban economy, mobility, environment, living, people, and governance. On the other hand, ICT and construction industries stress to capitalize smart city and a new market seems to be generated in this domain. This chapter aims to perform a literature review, discover and classify the particular schools of thought, universities and research centres as well as companies that deal with smart city domain and discover alternative approaches, models, architectures, and frameworks with this regard. This research has been cofinanced by the EU (European Social Fund, ESF) and Greek national funds through the Operational Program “Education and Lifelong Learning” of the National Strategic Reference Framework (NSRF)—Research Funding Program: ARCHIMEDES III. Investing in knowledge society through the European Social Fund. Alcatel—Lucent. (2012). Getting smart about smart cities: Understanding the oarket opportunity in the cities of tomorrow. http://www2.alcatel-lucent.com/knowledge-center/public_files/Smart_Cities_Market_opportunity_MarketAnalysis.pdf. Accessed 10 Dec 2013. CISCO. (2011). European city connects citizens and businesses for economic growth. http://www.cisco.com/web/strategy/docs/scc/cisco_amsterdam_cs.pdf. Accessed 6 Feb 2014. Giffinger, R., C., Fertner, H., Kramar Meijers, E., & Pichler-Milanovic, N. (2007). Smart cities: Ranking of European medium-sized cities. http://www.smart-cities.eu/download/smart_cities_final_report.pdf. Accessed Dec 2013. Hitachi. (2013). Hitachi’s vision of the smart city. http://www.hitachi.com/products/smartcity/download/pdf/whitepaper.pdf. Accessed Nov 2013. IBM Institute for Business Value. (2009). How smart is your city? Helping cities measure progress. 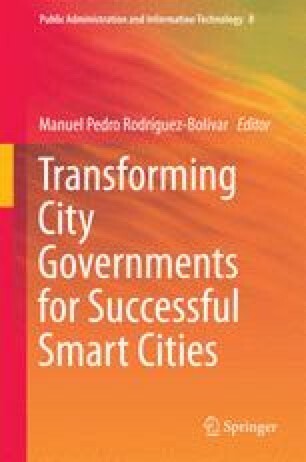 http://www.ibm.com/smarterplanet/global/files/uk__en_uk__cities__ibm_sp_pov_smartcity.pdf. Accessed 6 Feb 2014. Lee, J., & Oh, J. (2008). New Songdo city and the value of flexibility: A case study of implementation and analysis of a mega-scale project. Postgraduate dissertation, Master of Science in Real Estate Development, Massachusetts Institute of Technology. http://dspace.mit.edu/bitstream/handle/1721.1/58657/317296469.pdf?sequence=1. Accessed 29 Oct 2013. Marletto, G., (2014). Car and the city: Socio-technical transition pathways to 2030. Technological Forecasting & Social Change. http://dx.doi.org/10.1016/j.techfore.2013.12.013.